1. 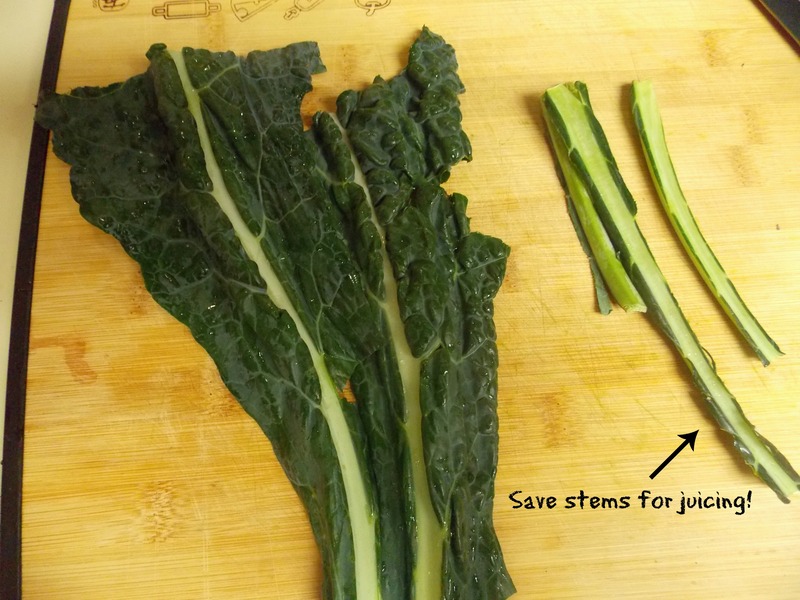 Start by stemming the kale and cut them in one inch square strips. 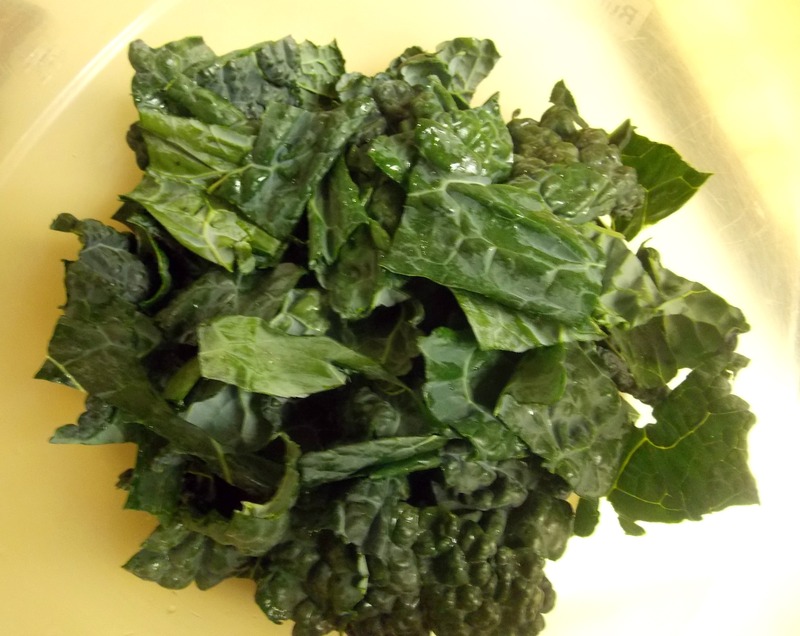 The stems toward the bottom of kale leaves tend to be tough to chew so I left those out. You can save them for juicing if you don’t want them to go to waste because they do have nutrients. 2. Next, juice your lemon and add into the chopped kale with the salt. Then with washed hands, add your 1/3 avocado and gently start kneading the kale until the avocado has completely coated it. 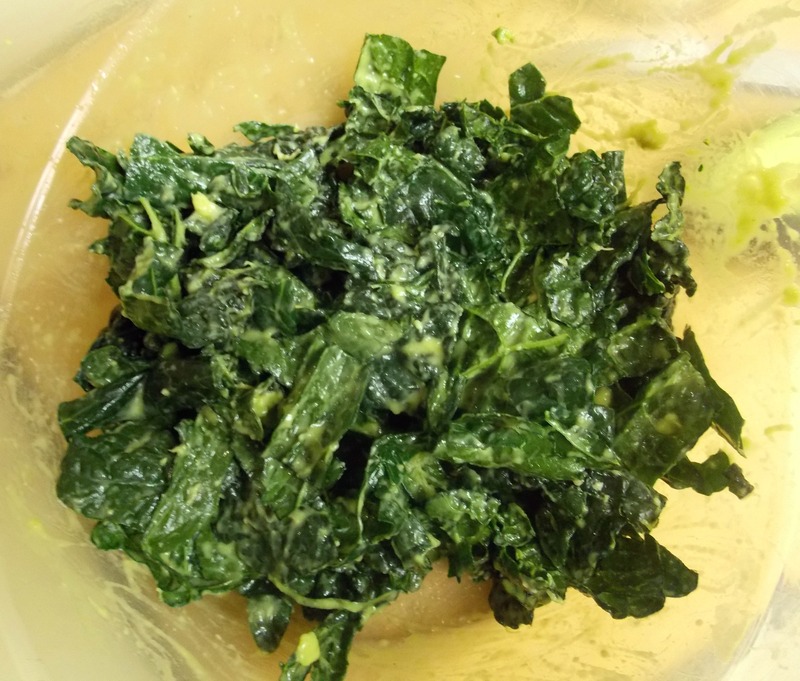 This process with the lemon and salt help to break down kale’s bitter green intensity to a romaine-like leafy texture. 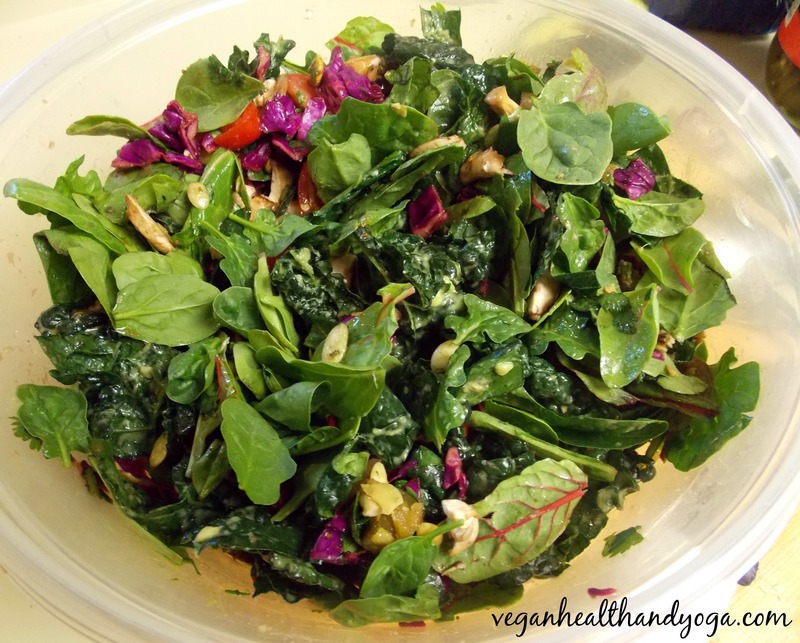 Its a messy job but you’ll get younger looking hands and a delicious salad as a reward! 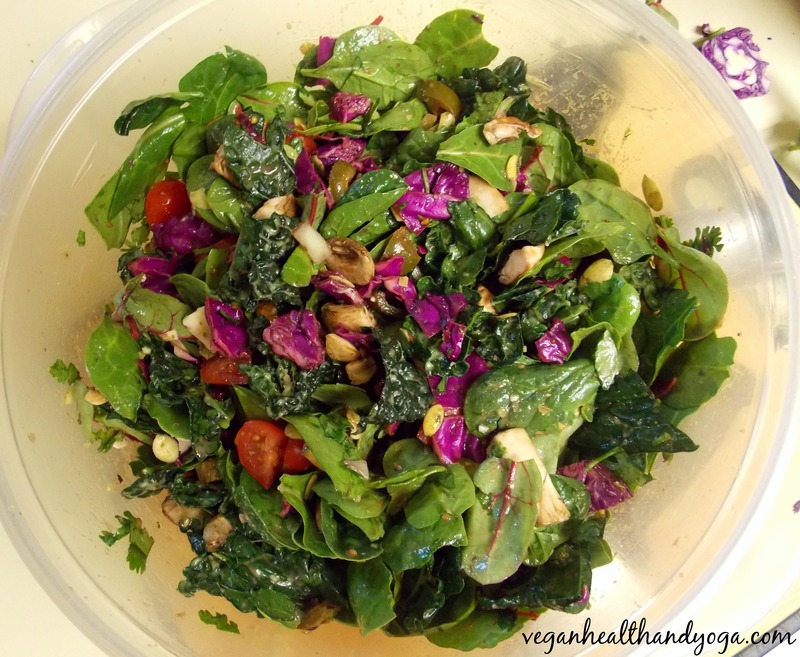 The avocado works as the dressing for the kale and also helps to balance out the flavor. 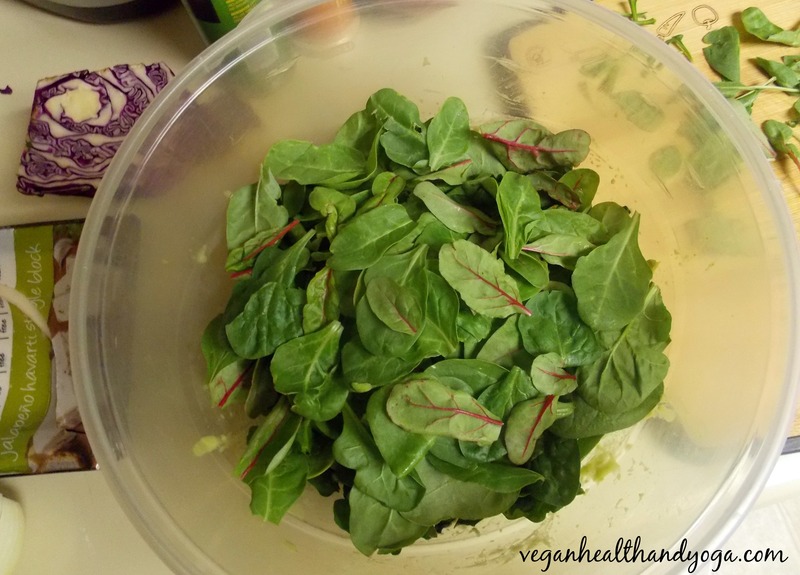 Add in the rest of the greens and set aside. This allows time for the kale to absorb the lemon and soften on its own. 3. 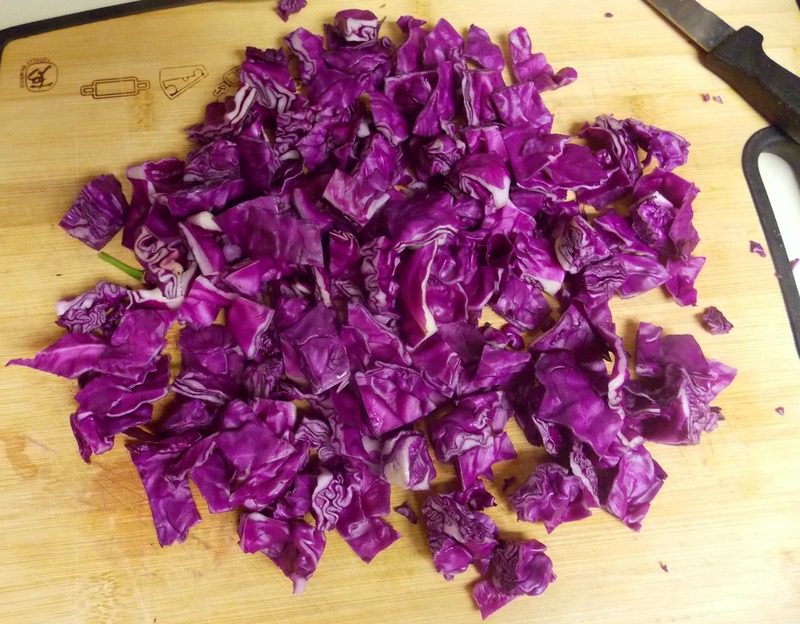 Chop 1 1/2 cups worth of red cabbage and place into a separate bowl. Add the juiced lime, garlic powder, sliced onions, minced cilantro, and your preferred balsamic dressing. I used a brand with no gluten, cholesterol, or sugar. If the one you have has sugar, make sure its not high fructose corn syrup and that its listed as one of last ingredients to minimize the intake. You could also just make your own. 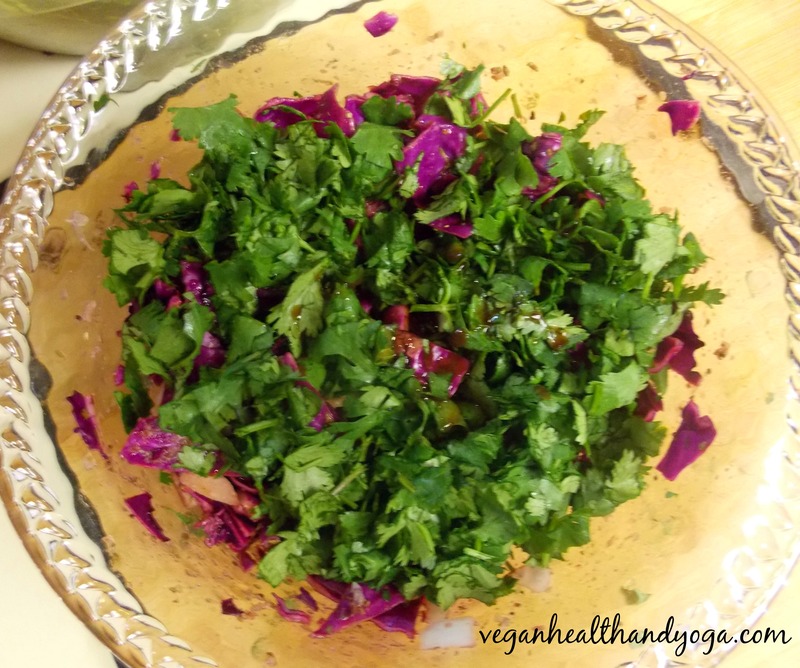 Mix everything thoroughly so that the cabbage is saturated with all the ingredients. I also like to do this apart from the greens so that all these flavors could get trapped into the crevices of the cabbage and so they don’t end up at the bottom of the bowl! 4. 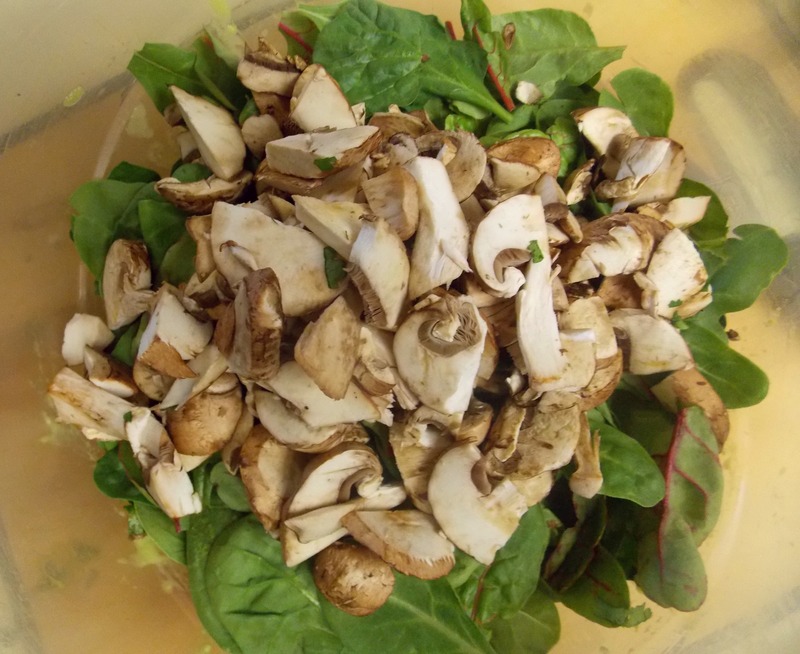 Now we pile up our kale bowl with the mushrooms, tomatoes, pickled jalapenos, and pumpkin seeds. As you can see, this salad is very “meaty” with lots of different ingredients. It will keep you satisfied a lot longer than having a salad made with mostly iceberg lettuce. 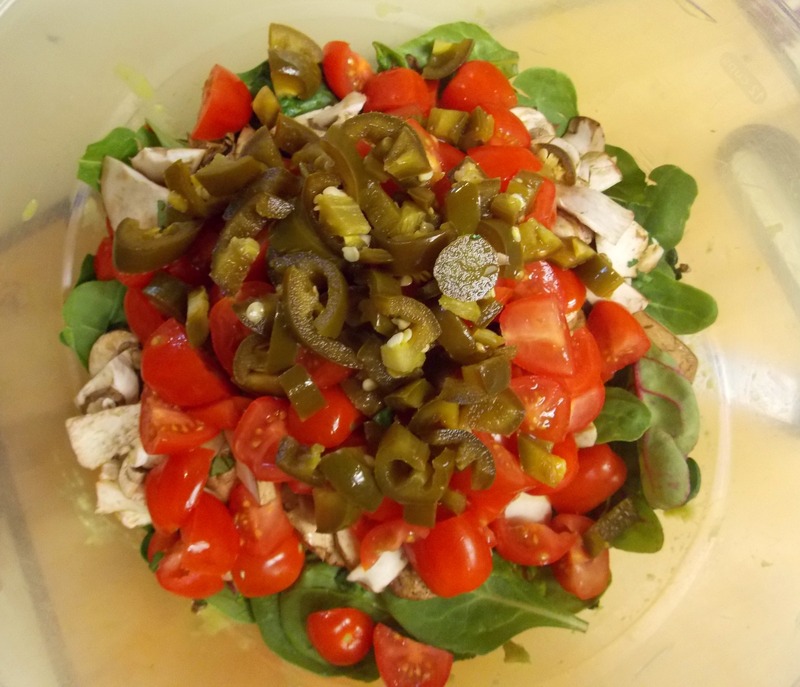 Its got protein from the greens, immune boosting vitamin C, tons of phytonutrients, and fat burning benefits from the jalapenos. Your also getting calcium and a dose of B12 from the cheese! I ate a big bowl with a side of roasted potatoes for dinner and was left completed satisfied for the whole night! To finish, toss in your cabbage and the jalapeno cheese and mix everything together. The mixing will gently “crumble” your cheese to give it that “feta style” and flavor. Your done! Enjoy it. Serves 4-6. 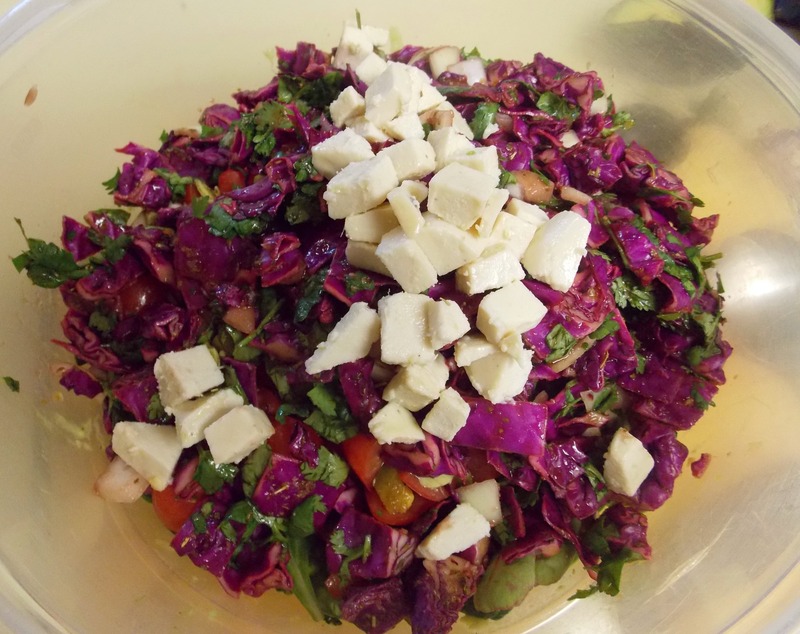 This entry was posted in Salads and tagged balsamic salad, gluten free, jalapeno kale salad, kale salad, vegan feta salad. Bookmark the permalink.